What Different Types of Blackjack Betting Are There? - Casino Answers! 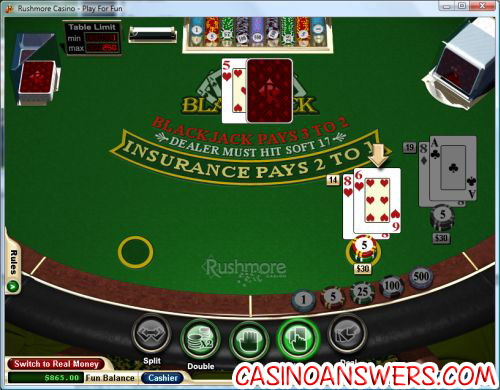 Casino Answers » Blackjack » What Different Types of Blackjack Betting Are There? What Different Types of Blackjack Betting Are There? Blackjack is a very simple game, and there really isn’t that much to it when it comes to betting, so you should have no problems understanding all the different methods of Blackjack betting. When you choose to hit in Blackjack, you are requesting that the dealer give you another card. You can hit multiple times, up until you are either happy with your hand or go bust. If you have a 9 and a 4 for example for a combined Blackjack hand value of 13 and choose to “hit”, if you get a 10 then you will go bust as your new combined hand value is 23. If you get a 4 however bringing your value to 17, you can then choose to “Hit” again, or if you are happy with your hand you can “Stand”. When you stand, or “stick” as it is also known, in Blackjack, you are telling the dealer that you are happy with your hand, and you don’t want any more cards. If you get dealt a 10 and a 9 for example, your combined Blackjack hand value is 19. If you tell the dealer that you “stand” then the dealer will now not give you any more cards, as you are happy with your current hand. When you double down in Blackjack, you are choosing to “hit” one more time, while doubling your bet. This is where a lot of the “gamble” and fun can come in when it comes to playing Blackjack, as doubling down can be a real rush. If the dealer deals you a 6 and a 5 for a total of 11 for example, then the odds are in your favour that the next card you get dealt will be a value of 10, for a combined value of 21. You also can’t go bust on the next card, so this is usually a great spot for choosing to “double down” as you will more than likely receive a card that will allow you to beat the dealers hand. So you place an additional bet, the same value of your original bet, and get dealt one more card. If you receive two cards of the same value – for example your hand is :5c::5d: then you have the option of splitting these cards. You can split them into two separate hands, by placing a bet equal to your initial bet on the table(online this is done automatically when you choose to split). You are then playing two different Blackjack hands, and the dealer will deal out cards to both hands. The option to surrender isn’t found at a lot of casinos, but surrendering a blackjack hand is just as it sounds – you aren’t happy with your current hand, so you forfeit your hand. You can do this no matter your cards or the dealers cards. When you forfeit the hand you retain half your bet, and lose half your initial bet to the casino. The last option of Blackjack betting is the worst – insurance. You get offered Blackjack insurance by the dealer when the dealers face up card is an ace. If you choose to take insurance, then you place a bet equal to half your initial wager. Blackjack insurance bets are basically a side bet – if you place an insurance bet you are placing a bet that the dealer actually has blackjack. If he does, you get paid at two to one odds. However insurance bets are suckers bets. You should never take an insurance bet. Period. And now you know all the different kinds of Blackjack betting, go test out your Blackjack skills at the excellent Rushmore Casino. What variety of blackjack bets are there? What different types of blackjack bets are there? What different kinds of Blackjack bets are there?